We stock 2019 Dodge Journey models for sale at Premier CDJR of New Orleans in New Orleans, LA! If you are interested in a new Dodge SUV that offers a distinctive front fascia, crosshair grille, sculpted fender flares, and available dual bright exhaust tips, then take the quick drive from Metairie and Kenner to our Dodge dealer. Feel free to schedule your Journey test drive online. The 2019 Dodge Journey is available in four trim models. Beginning in the base model Journey SE, both FWD and AWD models are made to go the distance with a highway driving range of over 500 miles per tank. Regardless of if you choose 2.4-Liter Four-Cylinder Engine or the 3.6-Liter Pentastar® V6 Engine, you'll have seven-passenger seating with the standard third-row seat. Next up is the 2019 Journey SXT. Key features are its LED Taillamps and 17-Inch Aluminum Wheels. The 2019 Dodge Journey Crossroad offers a choice of front-wheel-drive and all-wheel-drive drivetrains. Notable features in the Journey Crossroad are Uconnect® with 8.4-Inch Touchscreen, Leather-Trimmed Seats with Sport Mesh Inserts, and a 10-Way Power Driver Seat. The Dodge Journey GT adds heated front seats, a heated steering wheel, and comes with the 3.6-Liter Pentastar® V6 Engine. Which new Dodge SUV will you choose to grow with your family? To help with your decision, our sales team is standing by. We are eager to guide you through these systems and comforts. Come to our New Orleans, LA, Dodge dealer and experience the 2019 Dodge Journey. 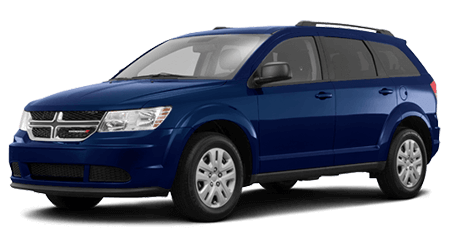 Get the ball rolling by applying for Dodge Journey financing near Metairie and Kenner! If you are ready to make a statement, take home a new 2019 Dodge Journey from Premier CDJR of New Orleans. Our Chrysler, Dodge, Jeep, Ram dealer boasts a skilled service department. Use our website to book your maintenance appointment. Visit us here in New Orleans, LA, to see the 2019 Dodge Journey!